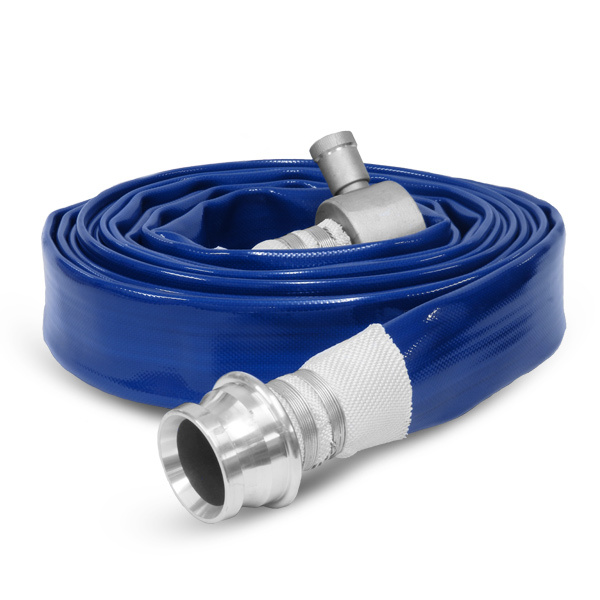 Our Aquaman WRAS approved heavy duty water hose is a general purpose layflat delivery hose complying with BS 6920 WRAS Material Approval. The hose is a high quality thermoplastic polyether based polyurethane (TPU) which is extruded through the weave giving a ‘Unified’ construction. This hose requires no drying after use. The Aquaman WRAS approved water hose is characterised by its extreme heavy duty, kink resistant structure produced with very low twist. It is a multipurpose hose suitable for a wide range of applications. The Aquaman heavy duty water hose is principally used by the Utility Companies. However it is a multipurpose hose also commonly used within the shipboard and marine industry, on refineries and construction sites for the transfer of clean water. The hose jacket is a 100% polyester high tenacity yarn with circular woven warp and weft threads reinforced. The unified construction is made of a high quality thermoplastic polyether based polyurethane (TPU) extruded through the weave. The inner lining guarantees a smooth surface and low friction loss. All standard lengths can be supplied from stock, however RHL specialise in the cutting and assembly of non-standard lengths to satisfy customers individual requirements. It complies with BS 6920 WRAS Material Approval.